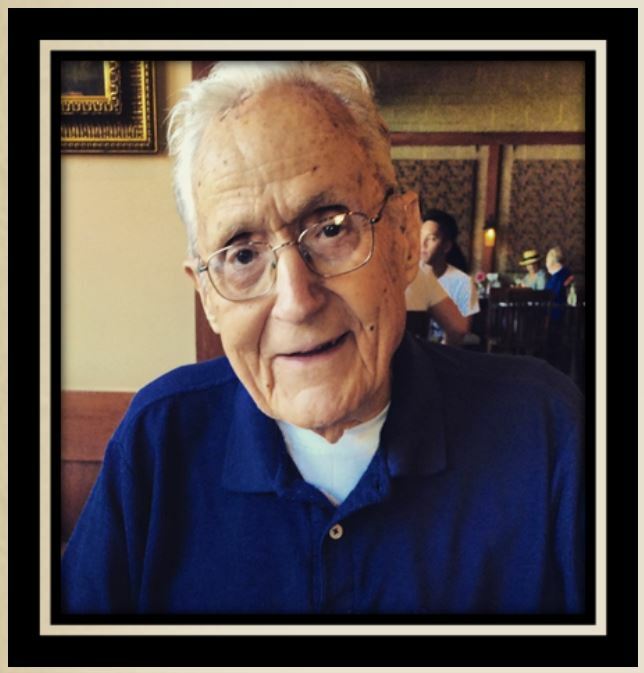 Vincent Carl Erickson passed away in Salem, Oregon on Saturday, April 9, 2016 at nearly 99 years of age. Vincent was born on July 23, 1917 in Mulino, the son of Albert and Mina Erickson and youngest brother of Virgil, Bernice, Blanche and Dorothy. Growing up, he helped his father at the family’s general store, then attended Molalla Union High School (Class of 1935). After graduation, he met neighbor Norene, and they married shortly thereafter on December 31st, 1938, moving into a home they built in Mulino. Vincent then got a certificate in Accounting from Behnke-Walker Business College in Portland in 1938. He was inventive and resourceful, working in several industries during the course of his life, including finance, home remodeling, road repair, car repossession, ship building, and lumber. Vincent was also known as “Mr. Fix-It”, handily making repairs and fixing appliances around the homes of his friends. Vincent also had a fulfilling personal life. He and Norene had two children, Jim (who passed away) and Sheryl. In their free time, Vincent and Norene traveled extensively on road trips throughout the United States and abroad to Cuba, Panama, Mexico, Canada, and Europe. They traveled by small plane, cruise ship, as well as recreational vehicle, taking many trips with the Alpenlite Trailer Club with good friends. Vincent was action-oriented, enjoying camping, fishing, deer hunting, and other outdoor activities. Eventually, Vincent and Norene retired to the Paradise Island retirement community in Salem. Vincent remained active through his retirement, regularly partaking in monthly pancake breakfasts and weekly coffee dates, pinochle and pool games, and riding his bicycle around the community well into his nineties. After Norene passed away in December 2009, Vincent continued to live in the park and take care of himself, with help from good friends, until he passed away at the age of 98. Vincent is survived by his daughter, 5 grandchildren and 13 great-grandchildren. A service for Vincent will take place at 11am on Saturday, April 16th at the Canby Funeral Chapel (160 S. Grant Street, Canby, OR, 97013, Phone: 503-266-1144), with burial following at Zion Memorial Park Cemetery (2010 S Township Rd, Canby). Flowers, cards or contributions may be sent to daughter Sheryl Erickson at 3100 Turner Road #109, Salem, OR 97302.